Bud Hughes Americana & Folk Art, Stratham, N.H.
MILFORD, N.H. – Jack Donigian’s Milford Antiques Show was at near capacity in Hampshire Hills Athletic Club in this southern New Hampshire town on Sunday, November 25, at the end of Thanksgiving weekend. The shoppers came, looking for early Christmas and holiday shopping and home décor, buying period furniture and small antiques throughout the morning. Donigian said, “The hall was virtually full again this weekend by the time we opened for early admissions at 8:30 [am] even though there were a few regulars that were off for the holiday weekend. And we had more shoppers this weekend, too, when you count all three categories: early birds, regular admissions and the 9:30 free admissions!” He added that dealers told him sales were good this Sunday as well. Bud Hughes Americana & Folk Art, Stratham, N.H., set up for the short time of the show to sell and buy and seemed pleased to have been there. The amount of antiques he offered was limited due to the quick pace of the show, but he seemed to have chosen well, as a valuable tantalus, one of those mahogany boxes containing crystal decanters for rare wines or liquors, sold early that morning. 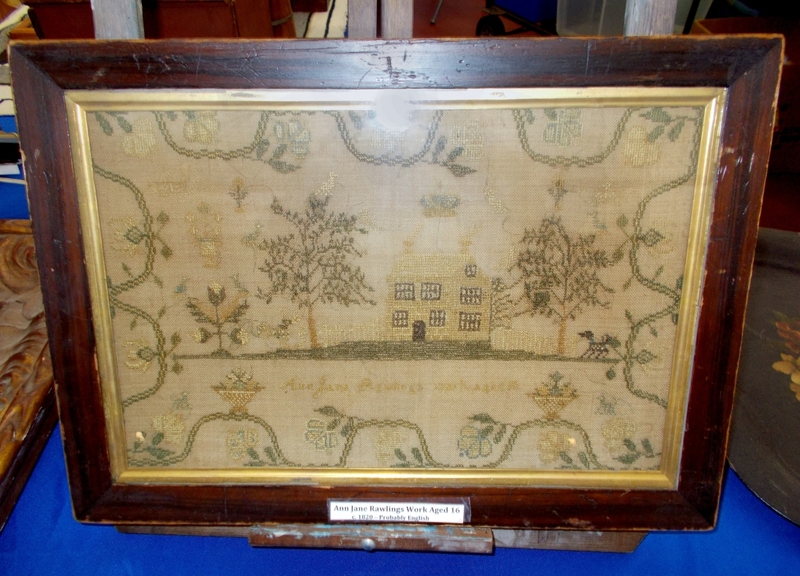 Hughes also sold a fine hooked mat with floral design and several other small items. His income that morning was good enough that he spent time shopping and found an early Nineteenth Century painted dome-top wooden box, a scenic painting and several small pieces to add to his collection. 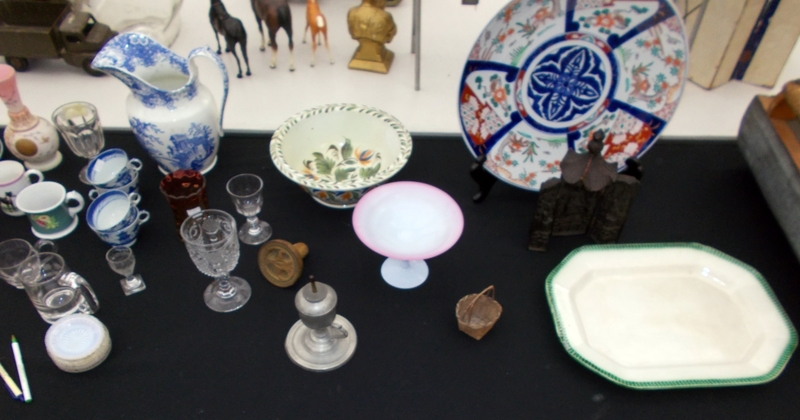 A frequent exhibitor at Milford, Robert DeLuca, from Ipswich, N.H., was showing a large collection of both seasonal items and traditional antiques. 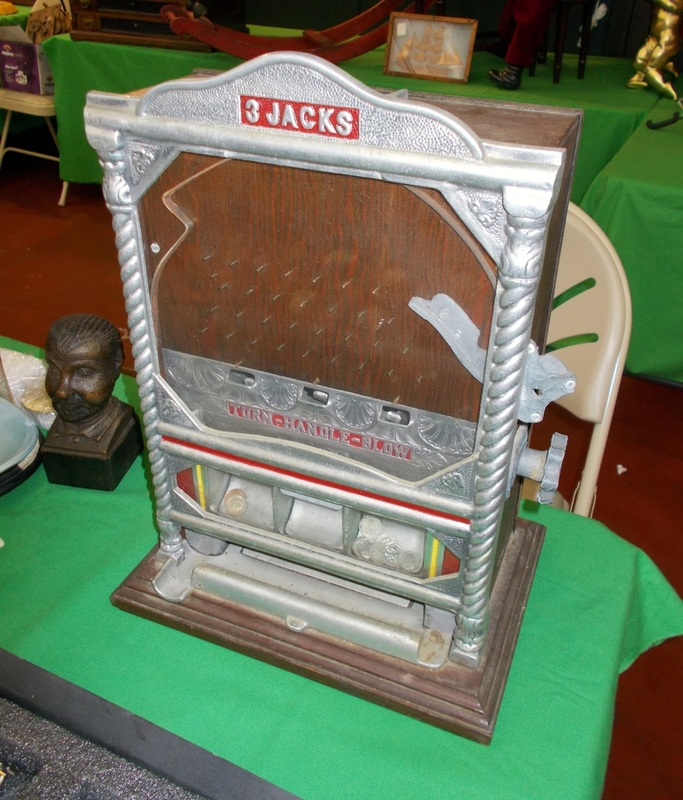 He was offering an early Nineteenth Century slot machine, the coin-operated gambling devices that are now obsolete but still fun; a large Santa Claus in velvet with a mismatched Mrs Claus; a six-drawer Coats and Clarke spool cabinet and more. 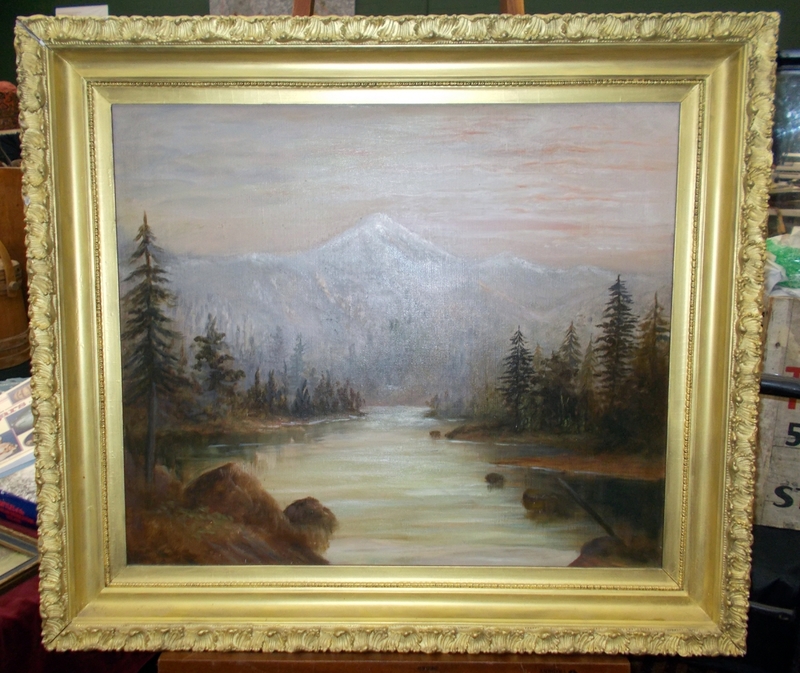 There was great interest in Mike Coffey’s unsigned painting of Mount Hood, Oregon. While not sold by the end of the half-day show, there was enough interest in this Pepperell, Mass., dealers’ artwork that he might get a follow-up. Furniture was selling well. Virginia and Patrick Renschen, Middletown, Conn., said they sold a Hepplewhite chest early that morning and a small Georgian table. 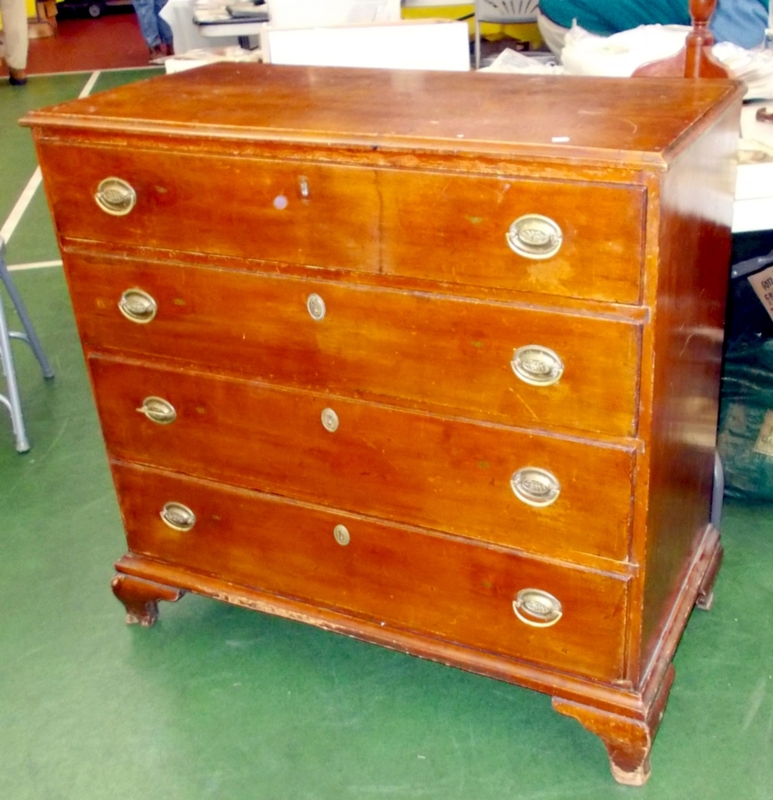 Eddie Saarella, Marshfield, Mass., was offering a circa 1800 four-drawer cherrywood chest of drawers, likely American, in early finish. David B. Searles II, Portsmouth, N.H.
Dave Smith, New Boston, N.H., had a booth filled with early advertising. 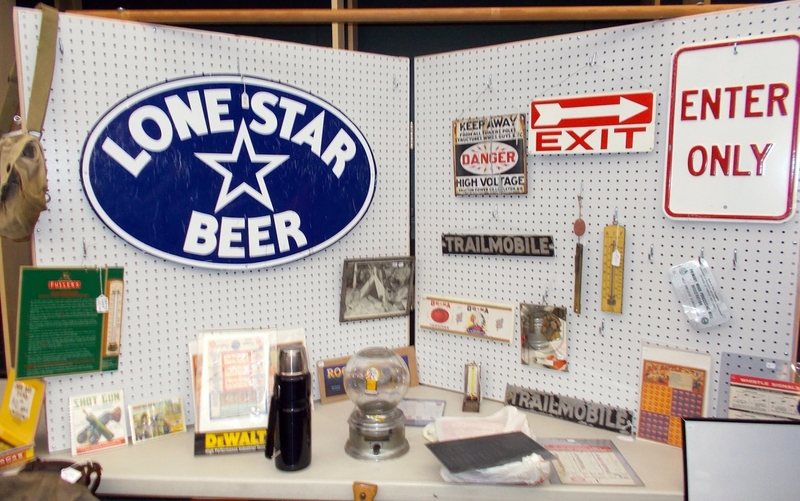 The variety included Lone Star Beer, Trailmobile, as well as many warning and directional signs for sale. At the Milford show nearly every week is James Gahan from Falmouth, Mass. Gahan’s collection is always different, but at the same time always good early antiques, according to Donigian. This Sunday, he came in with a charming circa 1800 cherrywood Pembroke table with a stretcher base, probably from Connecticut, which sold in the first 30 minutes. 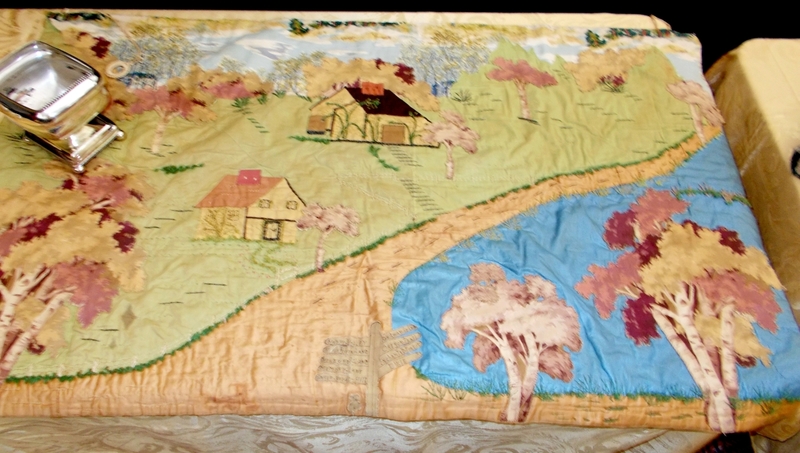 Also available was a very large textile lap cloth in silk with crewel work that depicted a small village next to a stream. 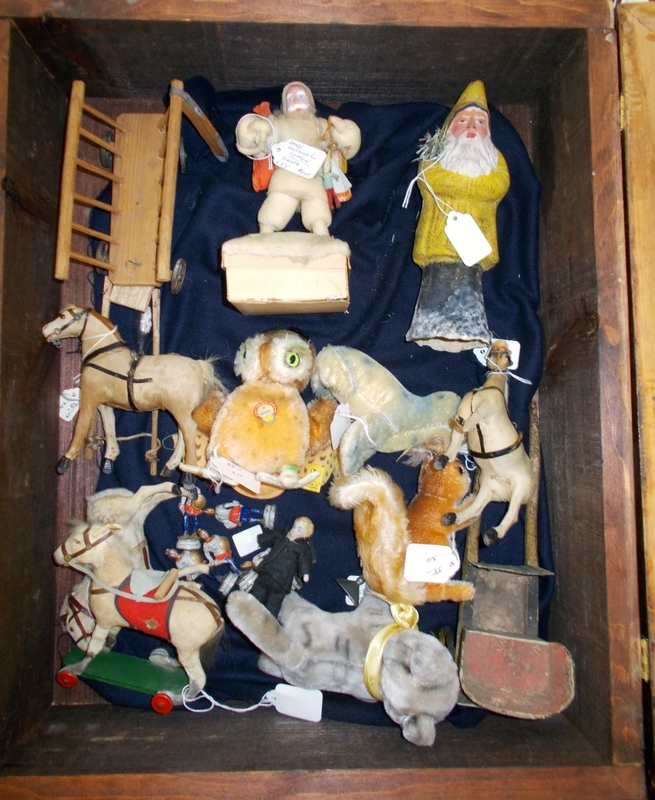 Mickey Novac, Monson, Mass., was selling early Christmas decorations and small belsnickel Santa dolls. 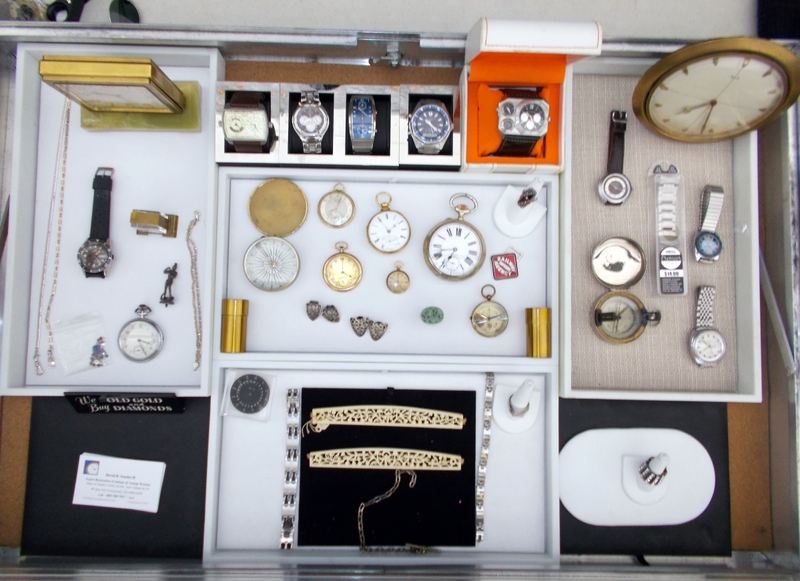 David B. Searle II, Portsmouth, N.H., trades in valuable antique pocket and wristwatches. 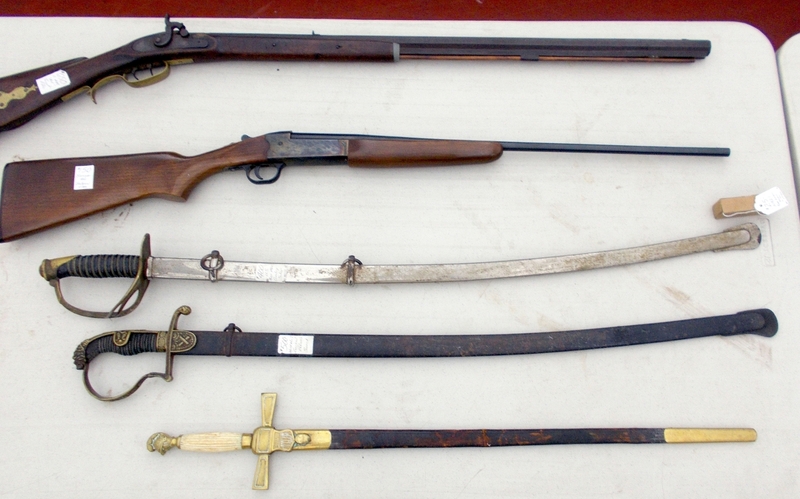 Brian Feltus, Townsend, Mass., offered a collection that included antique and vintage books. The show is short, but the action was swift, with good goods and good sales. The 11:30 am closing allows customers and dealers the rest of the day to do something else, which, according to Donigian, is a part of the show’s success. 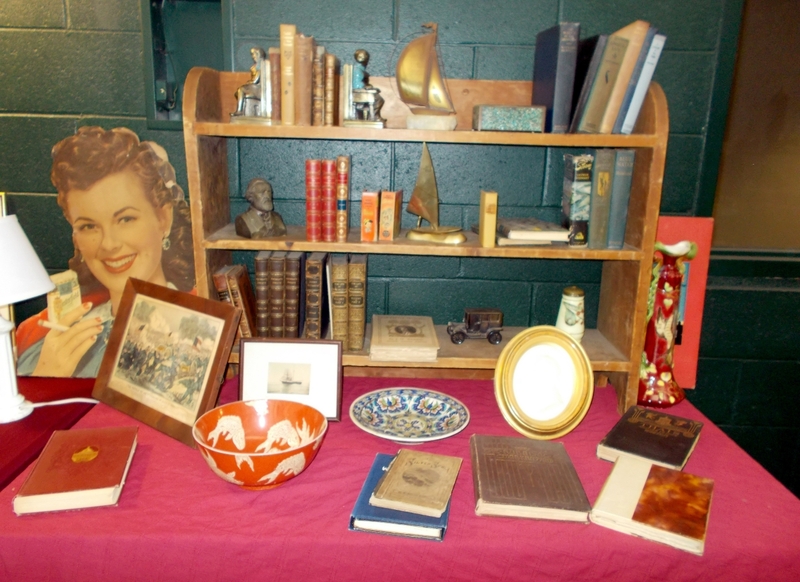 The Milford Antiques Show is unusual as it is every Sunday from late October until early April but only from 6:30 to 11:30 am. Early admission for $40 begins with the dealer entry and set up at 6:30 am, regular admission is $5 at 8:30 am, and free after 9:30 am. For additional information, www.milfordantiqueshow.com or 781-329-1192.